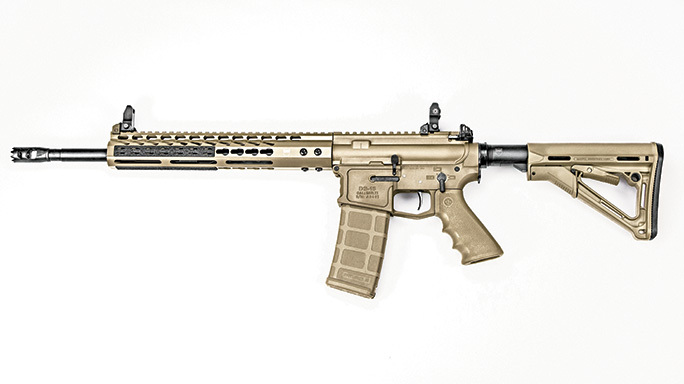 Simply add an optic to Dark Storm’s new FDE-finished 5.56 and start rocking like a hurricane! The author just added a set of folding Troy BattleSights and a Rail Panel Kit from Bravo Company Manufacturing for the range outing, where the DS-15 shined. The DS-15 Typhoon comes equipped with a Magpul CTR stock, a Hogue grip and a KeyMod handguard—all finished in Flat Dark Earth. The DS-15 is ready to go right out of the box. The DS-15 Typhoon’s black controls contrast nicely with its Flat Dark Earth receivers. The charging handle features an enlarged tactical latch for easy bolt manipulations. It’s not a typical greeting, but it is the one I got nonetheless when I walked into my local firearms dealer to pick up a DS-15 Typhoon rifle from Dark Storm Industries (DSI). 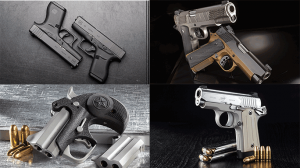 James Scavetta, the owner of Shadow Hawk, Inc., handles all of my firearm transfers. He was so impressed by the rifles that arrived from DSI that he called the company to talk to them about becoming a dealer before he even called me to let me know the AR-platform rifle had arrived. I could see what Scavetta liked about the rifle. The gun had an attractive Flat Dark Earth finish and was tricked out with a number of popular upgrades from the stock to the muzzle device. Picking it up, the gun was very balanced, and a cursory inspection showed the workmanship to be excellent. 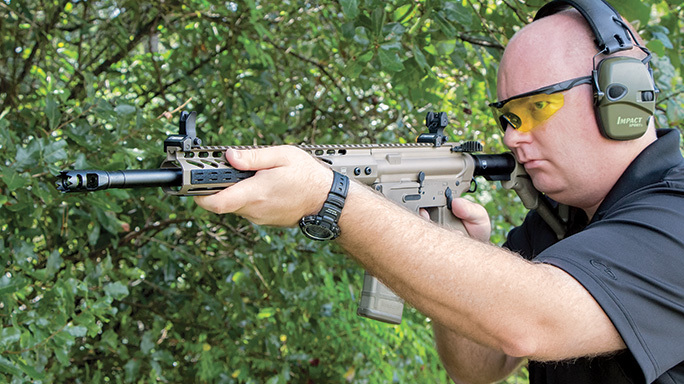 In a market saturated with AR-style rifles, it is tough for companies to stand out. Yet, out of all of the rifles coming through his doors, Scavetta was impressed by the DS-15. I looked forward to spending time with it on the range. The DS-15 Typhoon is a direct-impingement, AR-style rifle chambered in 5.56mm NATO. This chambering allows you to also safely shoot .223 Remington ammunition in this rifle. 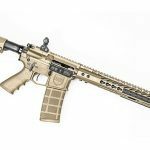 The rifle has a 16-inch barrel with a 1-in-9-inch twist rate that should be suitable for most light- and medium- weight bullets. The DS-15 Typhoon also uses a carbine-length gas system with a low-profile block. A muzzle device that is tipped with ten pointed teeth caps the barrel. The teeth are quite sharp and could be used for breaking glass. 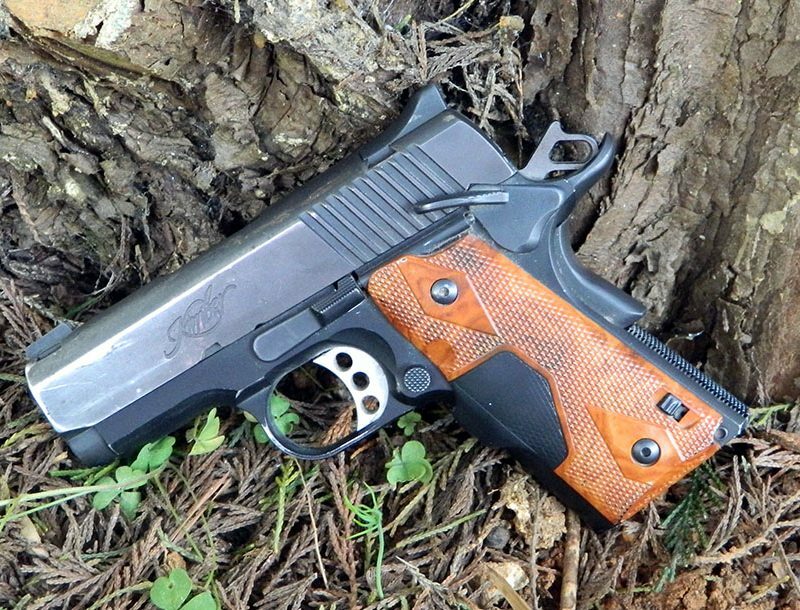 In addition to the aggressive look, the device is designed to reduce the recoil and flash signature when shooting. My test DS-15 Typhoon arrived with an upgraded 4-pound trigger. 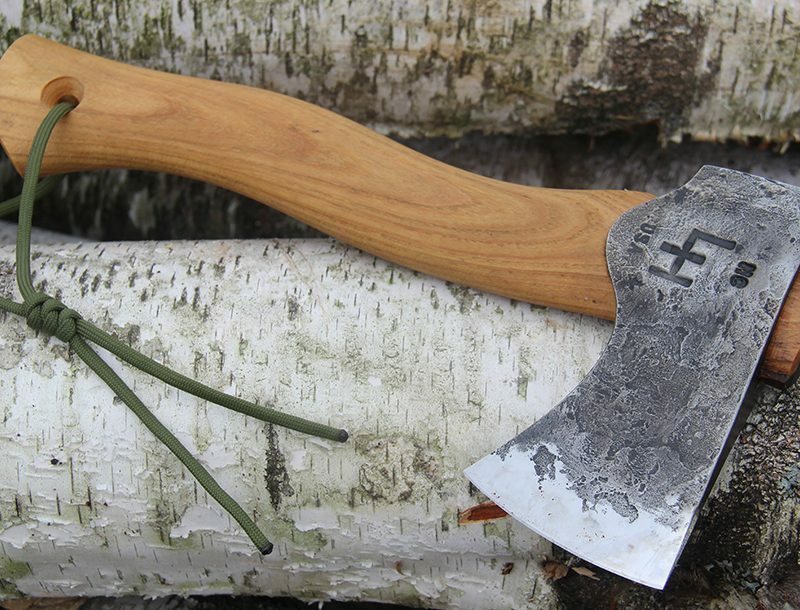 It has a thin profile and a smooth face that felt good to my finger. I felt no take-up in the pull or any overtravel. The reset was short and quick. A check on my trigger pull gauge showed the pull weight as being 4.31 pounds. According to DSI, the trigger upgrade is a $100 option at the time of purchase. For comparison, I had a chance to test another DSI rifle with the company’s standard trigger (see the DS-9 sidebar). The standard trigger is wider than the upgrade and felt like it had a slightly heavier pull. However, it also had no take-up or overtravel. Using the trigger pull gauge, I measured the standard trigger at 5.63 pounds. While I preferred the upgrade, the standard trigger is also very good, and many people should be quite happy with it. 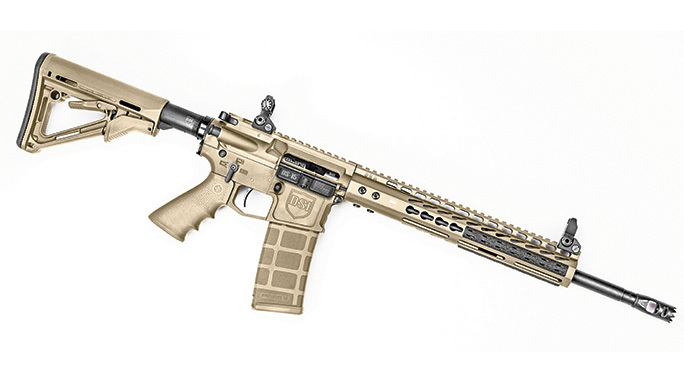 Instead of a standard handguard, DSI uses its own Ultralight Narrow-Profile KeyMod 12-inch Forearm. This handguard is made of 6061-T6 aluminum and is free floating. In the 12 o’clock position, the handguard has a full-length Picatinny rail. In the 3, 6 and 9 o’clock positions, the handguard has KeyMod attachment points for accessories. 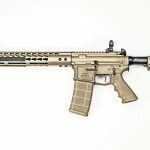 If you are not already familiar with KeyMod systems, the handguard uses a series of keyholes that accessories connect into. 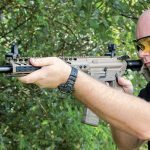 The primary advantage over traditional Picatinny rails is the reduced handguard weight. The KeyMod system also allows the handguard to be much thinner than a typical quad-rail setup. If you have an accessory that can only attach to a Picatinny rail, precise-length rails can be attached to the KeyMod handguard so there is only the necessary amount of rail. By using the KeyMod handguard, DSI was able to keep the weight of this rifle below 6.5 pounds. One of my favorite KeyMod accessories is the Rail Panel Kit from Bravo Company Manufacturing (BCM). These kits have low-profile panels with aggressive texturing that snap into KeyMod slots to provide an excellent gripping surface. The rail panels can be trimmed and easily fit around other accessories like lights and vertical grips. The Rail Panel Kits come in various colors to blend with your rifle’s finish. Attached to the rear of the rifle is the popular Magpul CTR stock. This stock is adjustable for length of pull and has a locking feature to reduce wiggle in the system once you find the correct length. The stock also has a QD attachment point for a sling. On this rifle, DSI uses a receiver endplate with a pair of oval attachment points for a sling. 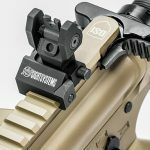 If you are running a single-point sling, this is a quick way to attach it to either side of the rifle and saves you the hassle of removing the buffer assembly to install one yourself. Additional features of the DS-15 Typhoon include an ambidextrous safety selector, an enlarged charging handle latch and a Hogue pistol grip. The large charging handle latch makes it much easier to run the gun while wearing gloves, and the Hogue grip is soft and fills my hand much better than a standard AR-15/M4-style grip. 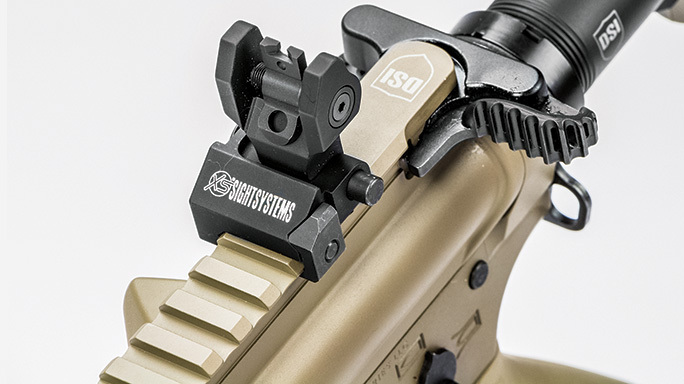 DSI ships the rifle with one 30-round Magpul PMAG. Without a doubt, the DS-15 Typhoon in Flat Dark Earth looks good, and it is certainly outfitted with many great features. But the most important question: Does it run? Happily, I can say yes. The DS-15 Typhoon ships without sights. For this review, I added a set of Troy Folding BattleSights with the XS Sight Systems 24/7 Tritium Stripe front post and the CSAT rear aperture. A self-illuminating post helps me find the front sight in low-light conditions. The CSAT rear aperture uses both a small peep and a pistol-type notch on the same plane. This allows me to zero the rifle at 100 yards with the small aperture and transition to the notch for 7-yard shots without any offset. At 100 yards with a front rest, I shot sub-4-inch groups with most ammunition using the iron sights. With a good scope, I would expect to halve those group sizes. The gun ran without any malfunctions regardless of the ammunition used. The gun ships with a Magpul magazine, but I tried it with a variety of magazines from Troy, Brownells and ASC without any feeding issues. Magazines inserted and dropped free without a hitch. This may seem like a superfluous concern, but an improperly applied finish can add enough thickness to the inside of a magazine well to hinder proper magazine exchanges. Fortunately, the DS-15 Typhoon did not exhibit any problems. The recoil was typical for an AR-platform rifle. That is to say it was light and easily managed. New shooters and those who are recoil sensitive will not have any problems handling this quality AR-platform rifle. At the range, follow-up shots were easy, and with the CSAT rear sight, transitioning from distant to close-in targets was very quick. I like the DS-15. It is a well-built rifle that performs well on the range. That alone makes it worth consideration. When you add in the Flat Dark Earth finish and quality furniture, the gun becomes even more appealing. For more information, visit dark-storm.com or call 800-963-7700.